I love cooking! Being a stay-at-home mom who lives far from hometown, I need to cook everyday. I'm loving it. But! 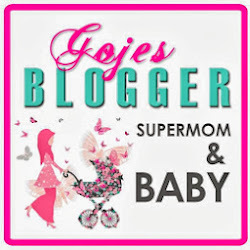 Currently I have no mood to cook in my kitchen maybe because of the pregnancy hormones! Kihkihkih. 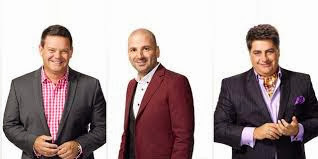 However, its doesn't stop myself from feast my eyes by watching my favorite cooking reality show Masterchef Australia. 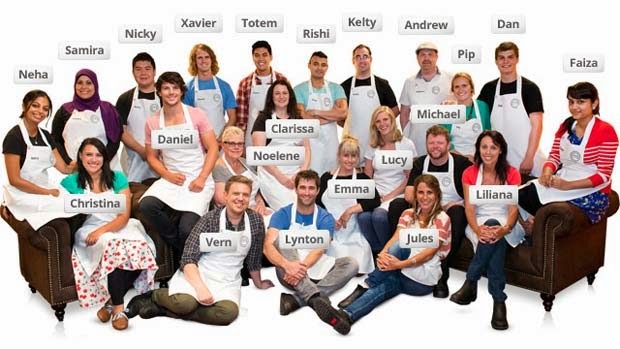 The 22 contestants. I'm the 23rd, that why there is no 'Kina' . Hihihi. Just kidding! Even though its already season 5, its never failed to surprise me in each season. Every episode in Masterchef Australia season 5 brings my adrenalin level higher and higher. 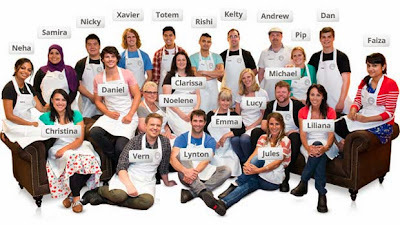 In this season there are a huge difference, which straight into top 22 best amateur cook and they are having boys vs girls challenge. I'm definitely on the girl's side. Hahaha. Go go girl power! But we cant underestimate the boys, they are simply surprisingly good cook despite of their look. From left -~ Gary, George and Matt. My fav is George! He is the funniest among all. 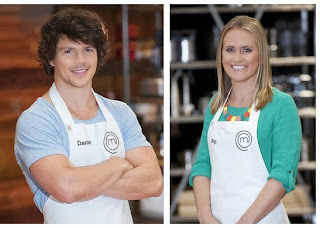 My favourite episode in Masterchef Australia season 5 is identical twin. It is one of the challenge for the contestant who had been eliminated to come back to the competition, while for those who not been eliminated yet have the chance to win immunity pin. In this challenge, they were paired up and need to create the same look and taste dishes without see and taste the others. Its tough but can be done amazingly with good communication and good cooking skills. I felt sorry for Pip who paired up with Daniel made stuffed squid with corn puree and chorizo. I do blame on Daniel who do not communicate as Pip really need him to cooperate thus made her eliminated right away even though her dish is one of the best dish that day. I become emotional after seeing that. Haiya.. That is the power of MasterChef! You can be so emotional, passionate and excited in the same time. Hihi. 1) to prevent chocolate from seizing, make sure there is no contact between chocolates and water or moisture. so make sure the bowls and utensils are dry. 2) to identify the freshness of the egg, put it in a bowl of water. If it lies in the bottom of the bowl it is fresh. If it is floating, you can throw them away. 3) put a few drops of oil and 1 spoon of salt when boiling pasta to avoid them clumping and the salt make them taste better. 4) to avoid tearing during chopping an onion, chopping as fast as you can so the tears have no time to burst out. This is hard man. Hahaha. 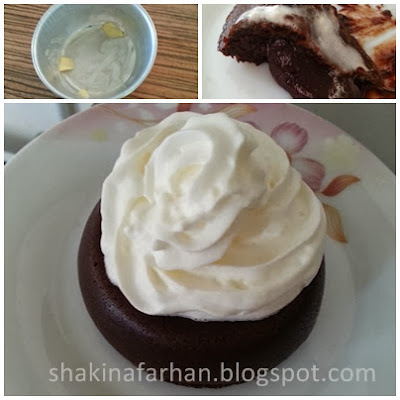 Grease with butter to have 'good looking' chocolate lava. Make sure shake if after bake. Submit your cooking tips like I am on Lifetime Malaysia Facebook with #MCATipOff tag now. The most creative/original cooking tip will also be aired on Lifetime! Fantastic right? Now, let me go back to my humble kitchen. Hehehe. shahadah dah nak jadi kak long dah. tahniah kak kina. Kina SAHM? Im soooo jealouss!!!! But it must be so tiring, looking after shadah and cleaning and cooking etc. Hats off to you !! Salam kina.sori nk tbya.awk de jual madela harmony sealed lg ke? Klu ade pruce bp ye? Liyana: hahaha..da lama xtulis english..
Kak nawal: tq! u can be one too! Anis: Next pre-order kina kena confirmkan dulu dgn supplier..harga RM135 belum masuk postage..